 Use unsaturated fats without guilt. 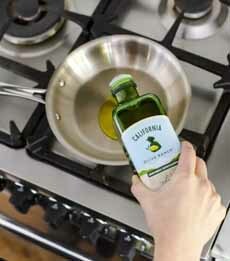 The USDA endorses two tablespoons of olive oil per day (photo courtesy California Olive Ranch). The chemical difference. The double bond is shown in red (image courtesy California Olive Ranch). 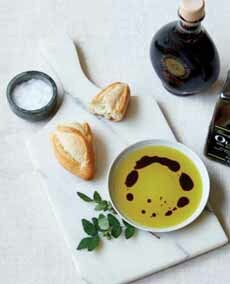 An easy way to enjoy olive oil: a bread dipper. You can add balsamic vinegar, spices or both (photo courtesy Murray’s). 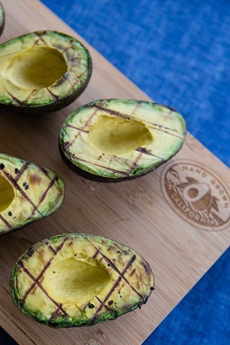 Some people avoid avocados because they’re high in fat—but it’s the healthiest fat, one that your body needs (photo courtesy California Avocado Commission). Recent research from Harvard Medical School has revealed that when it comes to maintaining health, the type of fat consumed is much more impactful than the amount of fat. The nutritionist-recommended Mediterranean Diet includes many foods with high levels of unsaturated fats, like nuts, fish and extra virgin olive oil. Thanks to California Olive Ranch, producers of extra virgin olive oil (photo #1), for today’s tip. What are unsaturated fats and what is makes them such an important part of a healthy diet? 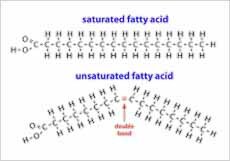 Scientifically, “unsaturated” fats refer to fatty acid chains that contain at least one double bond in their structure (image #2). When a fatty acid contains a double bond, it is less stable, and more difficult for the body to absorb and store as fat. This promotes health because these fats take longer to digest, allowing your body to absorb more of the other nutrients. The double bond is also responsible for keeping unsaturated fats liquid at room temperature. Saturated fats have no double bonds, and their connecting bonds are smooth, keeping them solid at room temperature. You see that solid fat in butter, lard, meat, vegetable shortening, and other foods. Depending on how many double bonds they contain, unsaturated fats are classified as either monounsaturated (one [mono] double bond) or polyunsaturated (with two or more (“poly”) double bonds). Both are good for us, although with slightly different health benefits. Monounsaturated fat is one of the healthy fats, along with polyunsaturated fat. They are a type of fatty acid that have one unsaturated carbon bond in the molecule (image #2). Those that are typically liquid at room temperature (e.g. olive oil) start to harden when chilled. This is the opposite of saturated fats like butter and trans fats*, which are not good for you. Saturated fats are solid at room temperature. . These unhealthy fats can increase your risk for heart disease and other health problems. Monounsaturated fats are found in plant foods such as vegetable oils, nuts, avocados and olives. It is these monounsaturated fats that are central to the Mediterranean lifestyle. Eating moderate amounts of monounsaturated (and polyunsaturated) fats in place of saturated and trans fats can benefit your health. Studies have shown that monounsaturated fats can increase the fluidity and elasticity of the cell membranes. And, at an average of 75% MUFA content, extra virgin olive oil is a great source. The fatty acids in 1-2 tablespoons of olive oil per day can reduce the risk of heart disease, diabetes, atherosclerosis and colon cancer, as well as reduce inflammation and improve cholesterol levels. Oleic acid, specifically, the primary monounsaturated fat in extra virgin olive oil, provides these health benefits. Polyunsaturated fats include the antioxidants omega-3 and omega-6. Omega-3 is especially important for us to eat, since the body cannot produce it. Both omegas are strong protectors against heart disease. That’s why extra virgin olive oil is so important in your diet. It contains, on average, 15% polyunsaturated fats, mostly linoleic acid. Foods high in omega-3 fatty acids include certain fish (herring, mackerel, oysters, salmon, sardines, trout, tuna and caviar! ), ground flaxseed, certain oils (canola, flaxseed, soybean), and nuts and other seeds (walnuts, chia seeds). Other foods that are not as high in omega-3, but still have decent amounts, include pastured eggs, omega-3-enriched eggs, meats and dairy products from grass-fed animals, hemp seeds and vegetables like Brussels sprouts, purslane and spinach. Not to mention walnut pesto, tuna tartare, pastured/enriched eggs, and grass-fed meat and dairy. And, have all the Brussels sprouts and spinach you like! *From the Mayo Clinic: Most fats that have a high percentage of saturated fat or that contain trans fat are solid at room temperature. Because of this, they’re typically referred to as solid fats. They include beef fat, pork fat, butter, coconut oil, shortening and stick margarine.